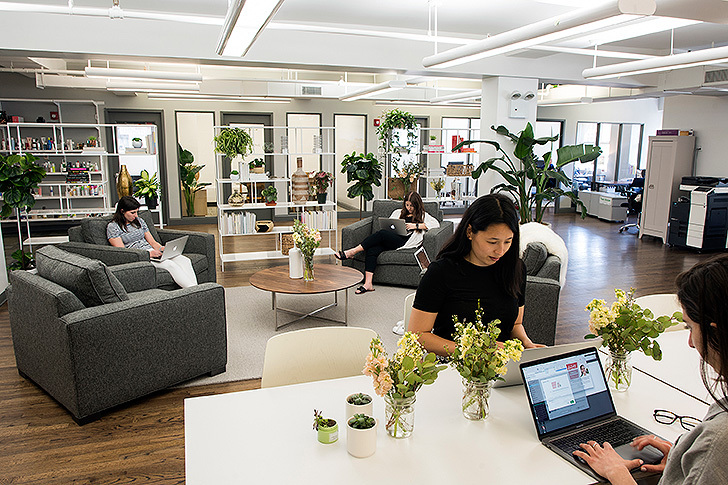 What was the design inspiration for how you wanted the Well+Good offices to look and feel? 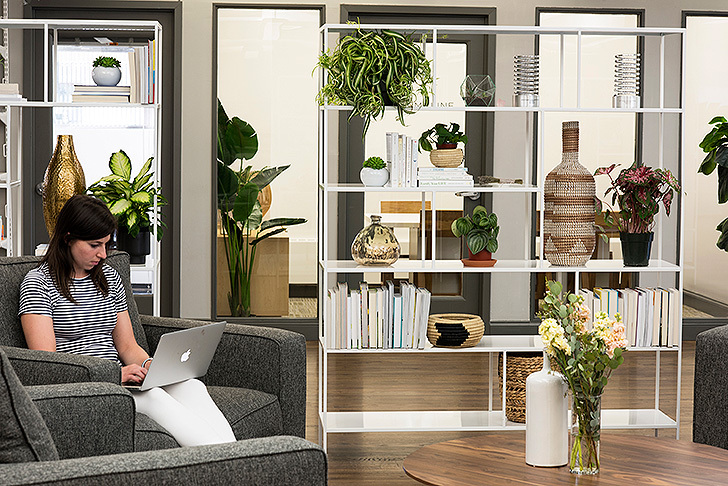 We wanted our office to feel like a super lush wellness haven that would personify the content we produce. Clean, modern, environmentally friendly, ​collaborative​, comfortable and inspiring were all keywords on our design mood board. What was the most important element in designing the Well+Good offices? We wanted to make it comfortable yet functional. Using classic, modern pieces that feel like a living space is key when you spend 8+ hours at work. 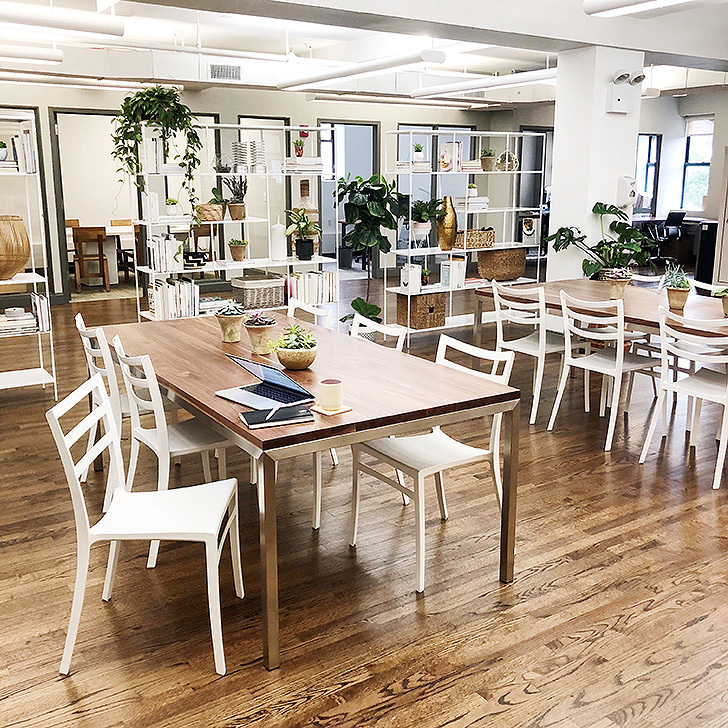 We love communal workspaces where we can meet to collaborate or pop away from our desks to work alone and focus, so that was definitely a goal of ours in our furniture selects. How is the team responding to the space? Has it changed how you work? 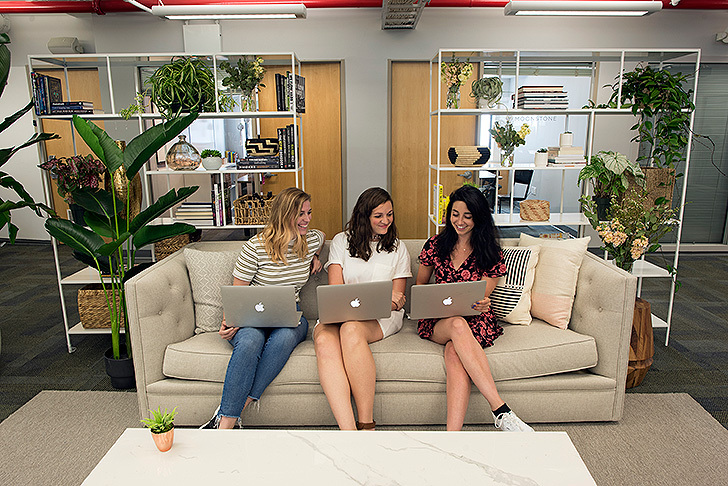 It been ​transformative!​ We used to spend lot of our meetings in conference rooms or at our desks, but now we have mini conversation nooks around the office for creative brainstorms and touch-bases, and the editors have lots of really lovely places to meet with new brands over coffee or do interviews. 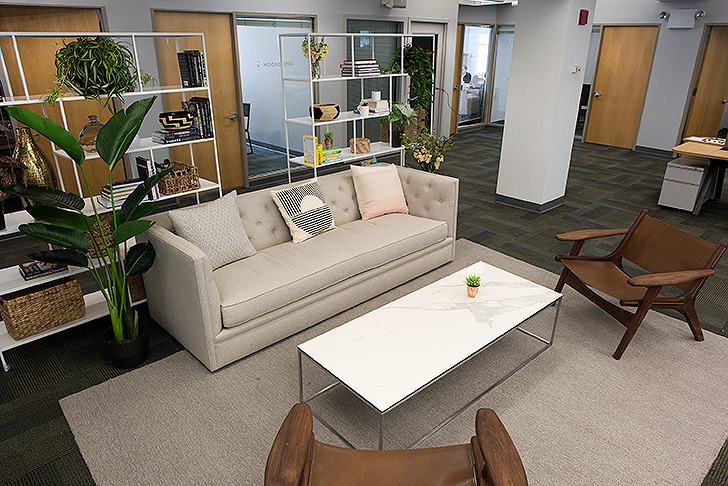 Creating welcoming, wellness-ified places around the office has been a game-changer. People love coming back to our office. What do you think sets your office apart from a “normal” office? Obviously, kombucha on tap and avocado toast 24/7 (Kidding…but only sort of). Truly I think it comes down to our team and how well we work together. We all support one another on projects and have several weekly reasons to come together (usually over healthy food tastings or a team wellness experience) that aren’t related to our roles at all. ​Having an environment that reflects and supports the wellness mission of our company and the passion of our team has been key.​ By marrying the two, we’ve created an amazing environment. How would you describe Well+Good’s aesthetic? Clean, bright, happy, and approachable. There’s a lot of greenery in your space. Was that an important part of the design? We work in New York City which is super inspiring, but can also limit the amount of greenery you see. 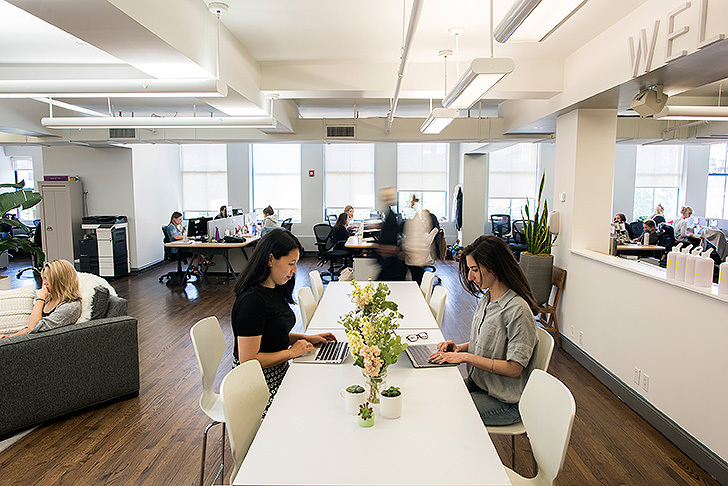 We’re really lucky to be right across from Union Square Park to enjoy the farmers’ market and afternoon clear-your-head walks, but building a positive environment inside our office that inspires the same feeling was important. Plus, we’re all really REALLY obsessed with plants here. What do you love most about coming into work every day? Every day is different for our design team, which is fun. We have our day-to-day work, but there’s always something new to hop in on for editorial or social. I love creating new things for new reasons — that’s where the learning, the challenge, and the surprise is. Do you have any tips for creating a balanced workspace? Make it feel comfortable, but practical for productivity. Our bookshelves are open on two sides and look beautiful around the office, but they also hold a ton of literal resources for our editors and help divide our very open floor-plan into more purposeful areas, like a “hallway” from the cafe area near the kitchen. What wellness trend are you currently loving? Matcha! But to me, it’s more than a trend—it’s a self-care practice because it’s the perfect excuse to get up from my desk, take time to be creative in the kitchen, and refuel with an afternoon treat. I love mine iced and with a dash of cinnamon. How did your Room & Board Design Associate help you with the layout or pieces you selected? We had an idea of the pieces we wanted, but our Room & Board Design Associate gave us additional decor options we didn’t even notice, like our Portica tables in the kitchen. (I’m so glad she pointed them out!) She provided insight on how we could place the pieces in our space and offered a few variations of the potential layouts until we settled on the exact selects. It was an incredible help since none of us had designed a space of 11,000-square-foot before. You wouldn’t know it by looking at it. What was installation day like? Our installation team went above and beyond helping us stage the room. We had our layout, but they really helped measure and make final decisions—all with a friendly attitude, which makes such a difference. 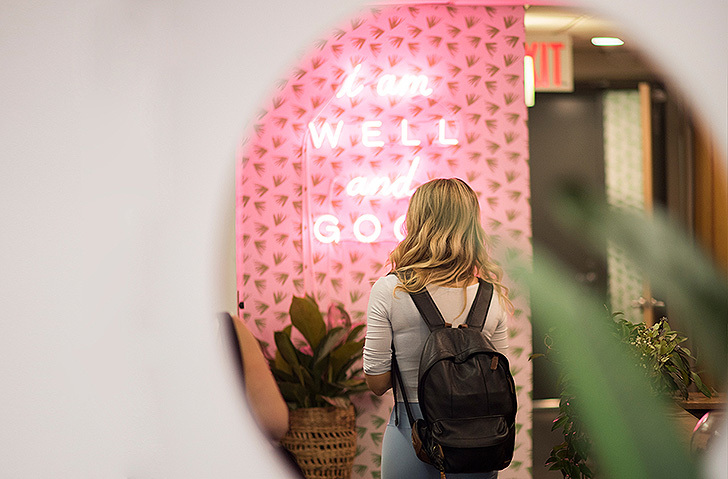 See additional photos of the space on Well+Good. Wishing for your own office upgrade? Room & Board Business Interiors can help you make it a reality.